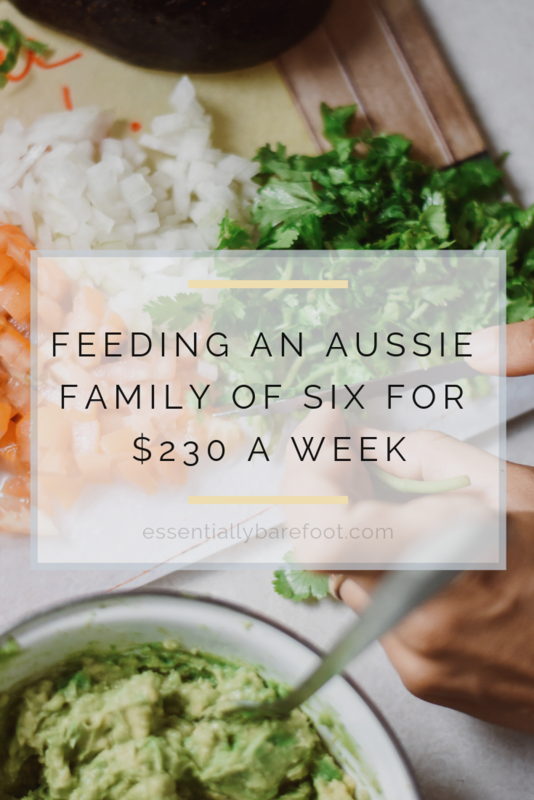 A big part of my job as a stay at home mum, is feeding our family of six, with meals that everyone eats, are healthy, and are somewhat budget conscious. Over the last few years I have worked really hard at bringing our grocery spend under control, because at one point it was ridiculous how far it had blown out, and for no real reason. We were eating the same types of meals, but we were spending a fortune at the supermarket, going back three and four times a week, and as always, what comes in, must go out, and it wasn’t always going out via our tummies. Not only were we wasting a lot of food, we were wasting a lot of money. A big change was menu planning and shopping to a list. It made a huge difference, and I noticed a drop of between 10 & 25% of our weekly spend on the weeks I did this. Over the last 18 months I have gotten very rigorous with the planning and listing, to avoid dawdling at the shops now that the kids are at home – the key to surviving grocery shopping with four kids in tow is to keep them moving so they don’t have time to spot things to ask for!! Once they started homeschooling, I also made it Mr12’s job to total our spend as we went. This carved off another 15% or so. I didn’t think it would make that much difference, but it was really noticeable. Part of which was because I wasn’t shopping for school foods – even thought we didn’t buy prepackaged things, there was always the thing or two that came home, but couldn’t be eaten because it was squished against a banana. Or the tub of yoghurt that had gone off after sitting in a school bag all day. Part of which was because we could have leftovers for lunch that required refrigeration or reheating, instead of having things that could be packed in a school with, at best, an icepack. The other part was because the impulse buys were part of the total straight away and not just absorbed into the total. It also established a bench mark of what I would expect to spend by certain touchstones in the shopping circuit, so I was able to get immediate feedback on how I was tracking against the budget. The last big change was shifting to click & collect shopping. I think it honestly shaved $30 a week off our bills. Again, I could see the exact total I had with every item added. I wasn’t grabbing things because I couldn’t remember how many loaves of bread I had in the freezer, or did we need more caesar salad dressing…only to come home and find we had three already. I can easily see the specials on items that I regularly buy, and adjust my menu plan accordingly, while still having access to my pantry to avoid said triple item overstock issues!! Now we have a highschooler, two primary schoolers, and a kindergartener, and we honestly can not believe how much we used to spend on groceries, when the kids used to eat so much less than they do now! * I am not a foodie. I cook because I need to feed the ravenous hoard of small people who storm my kitchen on a daily basis. As a result, I don’t have the most adventurous or fanciest meal plan out there. * following from this, we often repeat meals week to week. The kids get on a streak of their current favourite and ask for it constantly. I roll with what works. It won’t kill me to eat fried rice for 3 dinners and 2 lunches in a fortnight. It might, however, send me off the deep end to cook a meal only for every one to feel “not that hungry tonight thank you mummy”. * I do NOT buy homebrand. All products purchased in the below totals are brand name products, unless there is no option aside from homebrand. * Cleaning and personal care products are either home made or purchased through doterra. These would add no more than $20 a month to the total. Vitamins are also doterra, and purchased on a quarterly basis using accumulated loyalty credits. * our garden hasn’t been overly productive this month, so all fruit & veg are included in the total. Over summer, the weekly totals were consistently $30-$50 cheaper. * Saturday nights are pizza nights, which are homemade pizza’s, not bought pizzas. Lemon Mustard Chicken // ingredients carried forward from last week. Shifted to Sunday due to leftovers. meatloaf // chicken as above. Used extra mince for double batch of tacos. Monthly total = $908.88, for an average of $227.22 a week. I am quite happy with that total! As noted above, we did have one night of takeaway, and also had two days of travel where either we bought dinner on the road, or we were hosted by relatives. I haven’t included the takeaway costs in the grocery total, as it comes from a specific “just for fun” budget line item which gets expensed directly each week, so those spendings don’t affect the budget. The kids were on a bit of a fried rice kick, as you can probably tell! I love it for being an easy way to use up what we have in the veggie drawer, and it ends up being quite filling, leaving us with leftovers for either lunches or another dinner. Spaghetti is an old faithful, quick, easy, eaten by everyone, and can be stuffed full of veggies. It featured almost weekly this month as we’ve had a lot on and some late nights getting home, so it was helpful for those nights. So there it is. How I fed my family for under $230 a week in March! If you have any questions, drop a comment below and I’ll update the post as we go.